Be seduced by the Chalet " LA VELIERE " conveniently located near the cable car and minutes away from the shops of CHAMPAGNY EN VANOISE. A dream place for family holidays or between friends, " LA VELIERE " is a 110m2 chalet (10 people) with 2 floors full of charm and tradition. It's old authentic wood and refined decorations will enchant you. "LA VELIERE" has all the quality of a chalet full of charm in a quiet area at the centre of the village. The bedrooms are all different and decorated with taste with old authentic wood, original wooden furniture and cupboard, plus luxurious cotton curtains. During winter you will enjoy spending your evenings by the fireplace in a living room full of comfort. The chalet is fully equipped and offers a splendid view of Courchevel. It's location has a privileged access to one of the largest skiable area in the world: PARADISKI (including LA PLAGNE and LES ARCS) as well as the National Park of La Vanoise. An external room : with washing machine, a dryer, a second fridge with freezer, ironing board and iron, skis-holders, ... Terrace and garden: with outdoor table, chairs, long chairs. The 6 of us (covering 3 generations including our 2 year old grandson) thoroughly enjoyed out stay at Chalet La Veliere in Champagny. The chalet was more spacious than many self catered places we have stayed in previously, giving ample room for us all including the youngster to play. The kitchen was well equipped for us and we were all able to enjoy separate bedrooms which although not oversized, were again more ample than some places we have stayed. Access to skiing was also excellent. The chalet is almost on the same level as the gondola and only 2-3 minutes walk away in ski boots. The village is built on a steep slope so access from lower chalets would be more strenuous! The gondola took us directly up to the main ski slopes on the Champagny side of the La Plagne area, with ample opportunity to ski here, and also easy access over the ridge into the full La Plagne bowl. Going at New Year, with only early snow, the red runs down to the resort were not open, but to most of our party that was not an option anyway :). These were clearly being prepared though to open shortly. Finally, the village of Champagny was a great pleasure to stay in. Although there is some development this is still a village resort with a very local feel. When you ski into Plagnne Centre or Bellecote and see the huge developments there, it is a real pleasure to return to your own village. An excellent boulangerie a short walk away provided king every morning, and my wife and I would recommend a meal at the Refuge du Bois further up the valley at the village of Champagny le Haut (very French, and very full, but not to be missed for the local food!). All in all we would recommend this chalet to anyone. We are hoping to persude a group of friends to revisit next year! Had a wonderful week at Chalet Veliere. Four couples enjoyed plenty of space very comfortable bedrooms. Well equipped, beautifully furnished with separate ski and boot storage. We even made use of the washing machine. Great location only a few minutes walk to the telecabin in one direction and the village in the other. We love Champagny this was our second visit. Would stay at this chalet again. Roland and Maryse very welcoming. All in all an excellent place to stay. 23-30 Jan 2016. 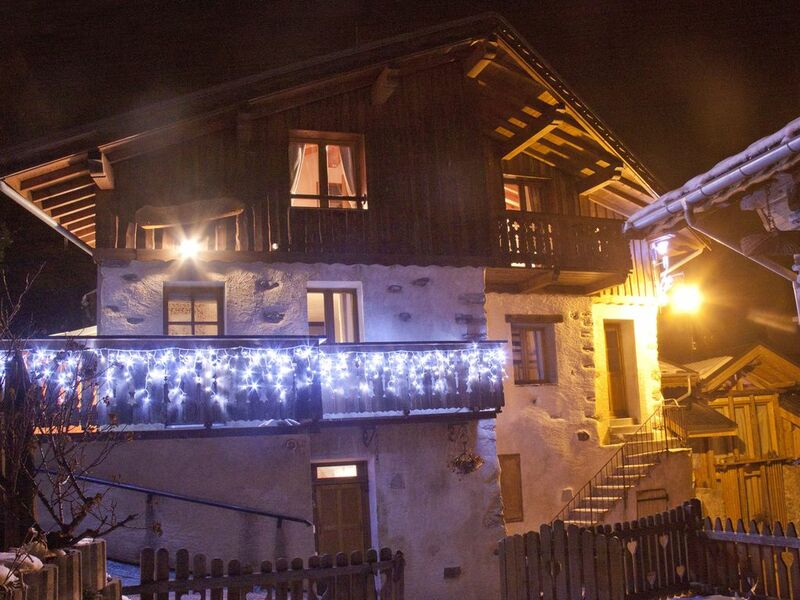 Chalet La Veliere is a fantastic property in the old part of Champagny-en-Vanoise, around 3-4 minutes walk from the gondola and 2 minutes to the shops and restaurants of the village centre, The chalet is comfortable and well-furnished throughout. It was spotlessly clean and tidy on arrival. Bedrooms are a good size and the kitchen is modern and well-equipped. Good wifi. Adjoining the chalet is a large and very useful utility room with washing machine and tumble dryer, as well as another full-sized fridge which we made use of. This also acts as a ski store and is warm enough to keep your boots in overnight as it also houses the boiler. There is a lovely sunny terrace at the front of the chalet with beautiful views over the valley to Courchevel. The owners live only 50m away if you need anything, and we found them to be very friendly and helpful. I would definitely recommend this chalet to anyone thinking of staying in Champagny, which is by far the nicest village of the La Plagne area. The property, and the condition in which it is presented to guests, is a credit to the owners. Nous avons passé un magnifique séjour, un accueil chaleureux, de jolies attentions.... Le chalet est superbe et très bien placé. Nous reviendrons avec grand plaisir. C'est avec plaisir que nous vous reverrons l'hiver prochain comme convenu. Excellent séjour:chalet impeccable et accueil chaleureux du propriétaire. Nous sommes dans l'attente du remboursement de la caution de 400 euros. Nous avons séjourné à 6 (dont 4 ados) puis à 8 sur la fin du séjour. Ce chalet était très propre et très bien tenu. Tous les appareils fonctionnent et sont de très bonne qualité (TV, lecteur DVD, Chaîne, électroménager Bosch..). Nous avons apprécié l'équipement culinaire en particulier les appareils à raclette et crêpe party. Nous mangions sur la terrasse plein sud de la cuisine face aux montagnes avec une belle vue sur Courchevel. Les remontées mécaniques (cabines) sont à moins de 5 mn à pied. Parfait pour les départs de ballade. Le plus; la piscine municipale (5 mn à pied) qui se découvre et se couvre selon le temps avec un espace gazon chaise longue et un SPA récent très agréable et accessible dès 14 ans avec un accompagnant majeur (14€/pers). Mes filles ont adoré ! Les propriétaires vivent à 50 m et sont très disponibles pour des conseils sur les randonnées. Roland nous a fait découvrir de très belles ballades avec nuit en refuge. Boulangerie à 2 mn et épicerie "Sherpa" à 5 mn à pied. Cette épicerie est très bien achalandée avec un très bon rayon traiteur de spécialités (fromages, charcuterie, plats, rôtissoire).. Pas d'hypermarché à Champagny. Nous y reviendrons en hiver (TGV-Moutiers puis navettes bus) car l'accès du chalet au domaine "Paradiski" est idéal.